The 25-year run of the Oprah Winfrey Show is coming to an end next week as the talk show host closes the doors and moves on to chair the Oprah Winfrey Network. The most watched segment from the show was the annual Oprah’s Favorite Things episode, where Oprah shared with her audience items that she felt were noteworthy or would make great gifts. In honor of Oprah’s last week on the air, I’m opening the doors to my crafting world and sharing my favorite things with you. While I can’t give them away as free gifts to my viewers like on the show, you do get a sneak peek into my crafting world and some great gift ideas for friends and family – or yourself! I work with micro seed beads. They’re often called sand beads, since at 22/0 and below they’re nearly as small as a grain of sand. I import needles from the U.K. since they don’t make them small enough in the U.S. Needless to say, it’s imperative that I’m able to clearly see what I am doing while creating my necklaces. The Ott-Lite magnifier is amazing! The full-spectrum light is bright enough to illuminate without being so bright that it creates strain on the eyes while using. My favorite part of this light is that it does not get blazing hot, even after hours of continuous use. 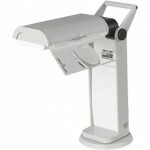 The magnifier on the Ott-Lite folds down when needed and tucks away when not in use. Sleek, and lightweight, this light can travel with me and does not take much space to store. I don’t know how I ever beaded without it! This is the glue of all glues. I started using it for scrapbooking and found that it attached hard-to-attach embellishments so well that I began using it for other crafts. I have now used it on everything from wood, plexiglass, paper, photos, and felt. This acid-free glue will not damage or discolor over time. It dries clear and very quickly. The tip of the bottle is small enough to do precision work but can be cut to make a larger opening. It is a must have for crafters and scrapbookers alike. And while it is pricier than Elmer’s Glue, it is well worth the extra cost. I’ve owned this paper trimmer for over five years and could not be happier with it. I’ll be honest – what initially drew me to Cutterpede was the affordable price. I’ve never looked back, though; over the year I’ve grown to love the ease of use and that I can find replacement blades and pads without having to search high and low. 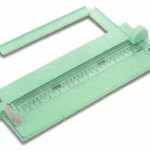 The square grid makes measuring easy and the pull-out, foldable arm allows this cutter to work with all different sizes of paper and cardstock. The blade cuts easily and does not leave impressions on your paper or photos. Tulle ribbon is common for wedding veils, gowns and bundling favors. That’s the only time I’d ever seen it used, so imagine my surprise when I was looking for a way to gift wrap my Etsy orders and came across it. I was looking for something to wrap a bow on the boxes I ship out that wouldn’t get crushed to death in a bubble envelope. I bought some tulle and found that the bows bounced nicely back into shape even after being squished down. 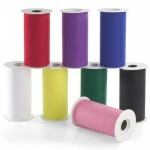 Tulle is inexpensive, does not require much skill to use and is available in a variety of colors. Love it! The Square reader is a must-have anyone selling at craft fairs. Accepting credit cards is one of the best ways to make big sales and stand out at a craft fair. Unfortunately, most credit card machines are very pricey ($250-350) and require a modem connection. This is not feasible for most craft fair vendors. Square is a card reader that works with iPhone and Android smart phones and allows you to swipe and verify using the cell phone network you’re already connected to. The best part is that the Square reader itself is FREE when you sign up! The processing fee per swiped transaction is only 2.75%, less than the more expensive card readers. Customers can receive an email receipt and even get a picture of the item they purchased included on receipt. Golden. I have to admit, I’m a sucker for scrapbooking paper – but I think the Die Cuts With a View matstack collections take the cake. 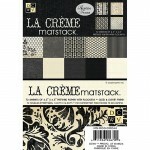 I first purchased the La Creme collection because I loved the flocking on the paper. The colors in the collection matched so well and were so complimentary that I just had to purchase other collections. I’ve loved each and every paper pack. I have used this paper for scrapbooking, card making, gift tags and other craft projects. 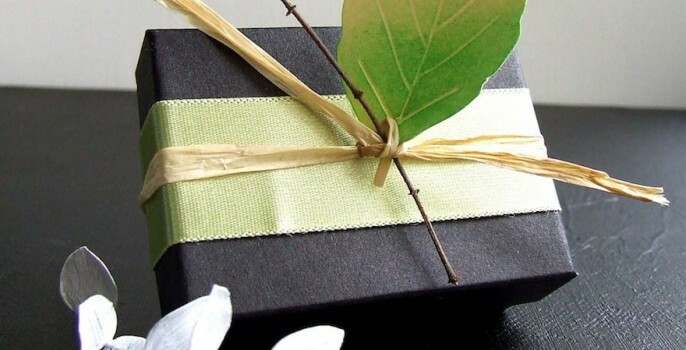 The paper is high quality and will not yellow over time as it is acid and lignin-free. I’ve used Sculpey to create all my polymer clay ornaments. I love that it comes in a variety pack so you don’t have to spend a fortune to get a ton of fun colors to craft with. 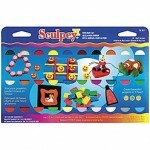 Sculpey expands minimally, so it can be baked right in the oven in just 10 minutes without losing the shape of your creations. I once worked on a project where a friend picked up the clay, and after the kids ripped into it and made their creations we dutifully stuck it in the oven. Ten minutes later, I went to check on it and the clay was totally melted – she had bought modeling clay not polymer! One of my biggest pet peeves while scrapbooking was having glue show through when I was trying to attach Vellum to paper. I tried everything – from spreading glue on with a paintbrush, dabbing tiny dots of glue, and even glue sticks. Nothing worked; that is, until I found these glue dots that are specifically made to attach Vellum. They work great! 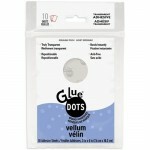 If you’re used to regular glue dots, you may be surprised that these come as sheets and not in rolls. I made my own wedding table numbers using these and it worked brilliantly. I will never again attempt to use anything else. As a crafter, I wash my hands a lot – especially while making polymer clay ornaments. This leaves my hands dry and my cuticles cracked. 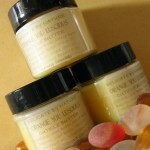 I was at a craft show recently and had a chance to try some of Delicate By Nature’s Cuticle Butter. I kid you not, it’s dreamy. It has a mild citrus scent and stays on all day after just one application. I’ve made treating my cuticles a part of my daily routine. I apply the butter once in the morning after my shower and once before bed. I’ve seen a dramatic improvement in my cuticles. Treat yourself, you deserve it. Cover image by Rach on Flickr. So excited that you are enjoying your cuticle butter to the degree that you would include it in your favorite things along with some other great products! Thank you Brittany!